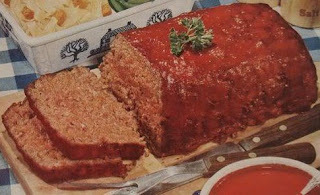 Here's another quick and easy recipe from ConAgra Foods which uses a can of Manwich Sloppy Joe sauce to make a moist and tangy meatloaf. The sauce is not only baked into the loaf but topped with it as well. I baked this in my 10 inch oven with 10 coals in a ring around the bottom and 18 on the lid, after 20 minutes I removed a few of the coals from the middle and let it finish cooking with one ring around the lid. Add chunks of carrots or quartered potatoes to finish off this one pot, zesty dinner. Set aside 3/4 cup Sloppy Joe sauce. Mix remaining Sloppy Joe sauce, egg, bread crumbs, onion, salt and pepper in large bowl until well blended. Add beef; mix until just combined. Mound mixture in bottom of dutch oven and shape into loaf, pressing firmly together and flattening top. Spoon reserved Sloppy Joe sauce over top of meat mixture. Surround with quartered potatoes if desired. Bake at 350 degrees for 40 minutes. Let stand 10 minutes before slicing. Hey Liddy, we made meatloaf tonight but I didn't specifically follow any one recipe of yours, but I needed to at least let you know how awesome it turned out. I did the basic mix (ground beef, onion/garlic powder, egg, oats, Worcestershire sauce, and a little tomato sauce) and added some Cabelas Prime Rib rub, then covered it with a tomato sauce and brown sugar blanket of goodness. Using my 12 inch DO, there was room for potatoes, carrots, and half an onion. 10 coals on bottom, 27 on top, and cooked for an hour. Turned out delicious. I was able to get all the veggies and meat out onto a platter and then I poured the juices into a saucepan and made some quick gravy for the potatoes. I ate too much tonight, but it was awesome. As always, thanks for your posts!